What about under the rocks, in the dark areas? Well these periphyton don't get light, so they are primarily filter feeders. So they REALLY grow and position themselves to be able to intercept food particles. And they don't really need to fight off algae, because algae does not grow in the dark, so they have no need for anti-algae tactics like plants in the light have. Reef studies have show that at certain depths, more of the filtering of the water comes from periphyton and benthic algae than comes from the phytoplankton which filters the deeper water. And in streams, almost all the filtering is done by periphyton. So, what you have on rocks that are "mature" or "established" is a well-developed layer of periphyton; and all the things that comes from it. However, what if you just re-arrange the rocks? Well, some of the periphyton that was in the light, now will be in the dark; so this part will die. And some of the periphyton that was in the dark will now be in the light, so it will not be able to out-compete photosynthetic growth and thus will be covered and die too. And even if the light stays the same, the direction and amount of water flow (and food particles) will change; sponges that were oriented to get food particles from one direction will now starve. So since the light and food supply is cut off, the filtering that the periphyton was providing stops almost immediately from just re-arranging. Starvation takes a little longer. The periphyton organisms won't die immediately, since they have some energy saved up; but instead, they will wither away over several weeks. 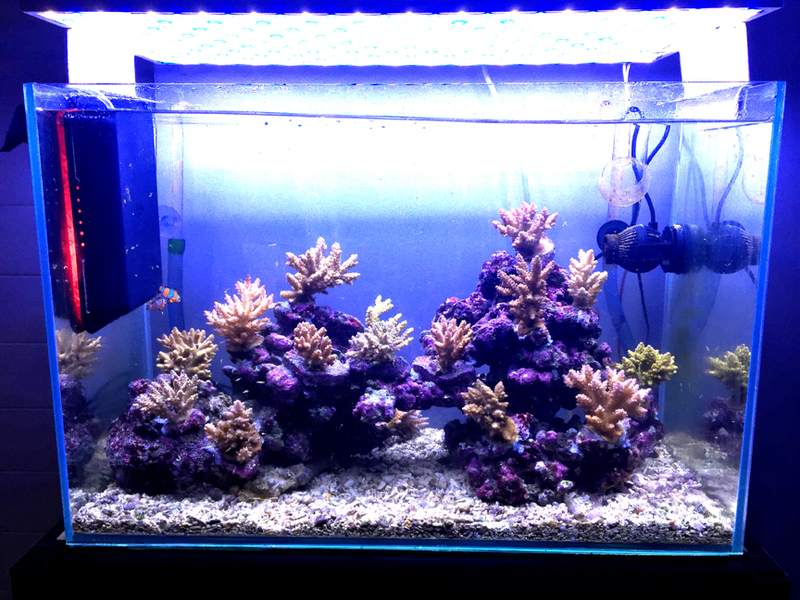 So on top of the instant reduction in filtering that you get my just moving the rocks, you get a somewhat stretched-out period of nutrients going back into the water. And after all this, it takes another long period of time for the periphyton to build up to the levels it was at before. Even changing the direction of a powerhead will affect the food particle supply in the area it used to be pointed at. This covering of the lights can be done by anyone, on any scrubber, even waterfalls. Waterfalls use plastic canvas which has more holes than material, and they are not in white compartments, so the light levels when new are not that high. But it still might help if a new screen stays completely empty or had bald spots. The reason for a white colors, of course, is too allow more light to reach the base of the growth that does the attaching to the surfaces. As the growth gets thicker, the bottom layers will almost be in darkness, so the white surface doubles the light there by reflecting instead of absorbing the light. If you are starting a new tank, then the obvious difference is that a scrubber gives you the option of not having a fuge at all because an upflow scrubber can be placed on top of, in, or behind, the display. There are other uses for a sump/fuge of course, but we'll only cover the filtration concerns here. A not-so-obvious difference is that a scrubber, if run together with a fuge with macros, will kill the macros even though the macros are much larger. This is because the scrubber thinks the macros are nuisance algae. 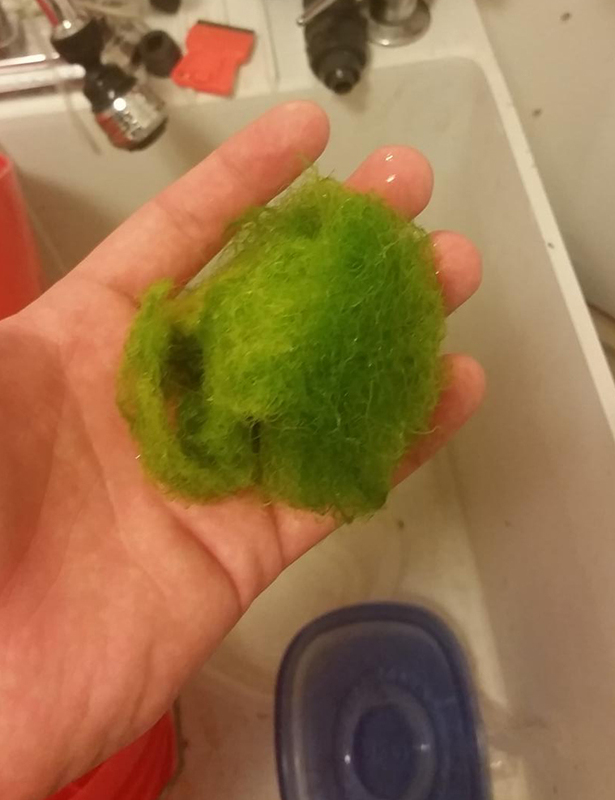 Some people do run both together without killing the macros, but this is just because their scrubber is not strong enough, and actually the macros might even be slowing down the scrubber because the scrubber thinks it has to remove the macros, along with the nutrients in the water and the nuisance algae in the display. However if this works for them, good. o Filtration with algae is proportional photosynthesis, which is proportional to Light X Air Water Turbulence Flow X Attachment. Meaning, stronger light grows more algae; stronger air/water interface turbulence grows more algae; and stronger attachment lets more algae grow without it detaching and floating away. A scrubber is thus designed to maximize Light, Flow, and Attachment. o The main problem with macros in a refugium is the self-shading that the macros do. Any part of the macro which is not directly in front of the light at any moment is not filtering. And any macro inside of a "ball" of macro (like chaeto) is self-shaded all the time. Only the surface macro that is directly in front of the light is doing any real filtering. A scrubber is designed to have all the algae in front of the light at all times. Rotating the macro does not solve the problem, because the time that the macro is rotated away from the light is time that the macro is not filtering. This is why it takes a much larger size of chaeto to do the same filtering as a scrubber. o Self-flow-blocking is another problem of macros in a refugium, for the same reason as light-blocking. And the thicker the "ball" of macro, the worse the flow-blocking. o Particle trapping is another result of a ball of macro. These particles need to cycle back around to feed the corals, but instead they get trapped in the macro and they rot, and in doing so they block even more flow and light. o With a scrubber, there is very little water standing in the way of the light. Also, the light is (or should be) very close to the scrubber... 4 inches (10cm) or less. The power of light varies with the inverse square of the distance, so going from 8" to 4" actually gives you 4X the power, not 2X. And the nutrient removal power of algae is proportional to the power of the light, because it's the photosynthesis that is doing the filtering. o Rapid flow across the algae in a scrubber gives more delivery of nutrients, compared to the slow moving water in a fuge. Filtering is proportion to nutrient flow. o The turbulence of water moving over the sections of algae in a scrubber help to remove the boundary layer of water around the algae. This boundary layer slows the transfer of metabolites in and out of the algae. There is no turbulence in a fuge (if there were, you'd have waves and bubbles). The interface between the air and water is what provides the most turbulence and boundary layer removal; there is no air/water interface in macros. 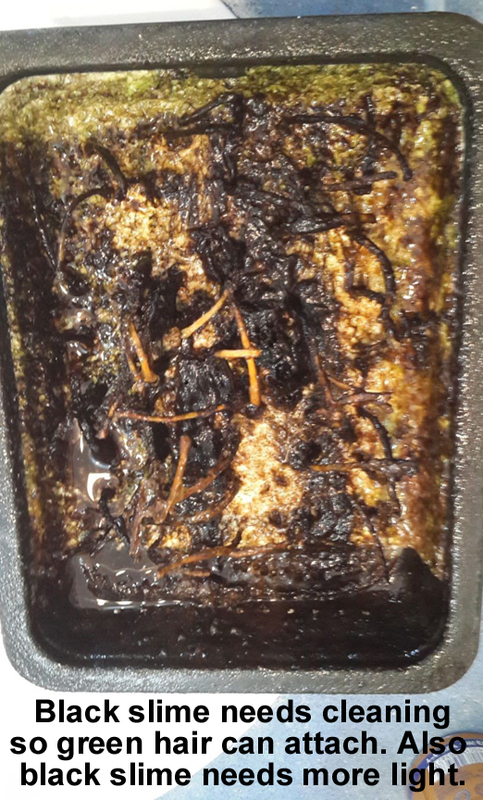 o Scrubbers do not let food particles settle like a refugium does; most particles flow right out of the scrubber. o Scrubbers do not (if cleaned properly) release algal strands into display, like chaeto does. o Scrubbers do not go sexual, like caulerpa can. o Scrubbers do grow lots of pods; more than was previously thought, especially if not cleaned with freshwater. o Scrubber don't, obviously, provide a place for snails and crabs, etc. However, if you already have a sump with an empty compartment, and you don't mind using all of it and putting a light over it, then maybe it's easier and cheaper to try macros first. When scrubbers are new, they will almost always first develop a slimey first layer of growth. This is because diatoms and dino's, which make up most of the slime, are the quickest to be able to "colonize" a new surface, sort of like weeds in a new garden. 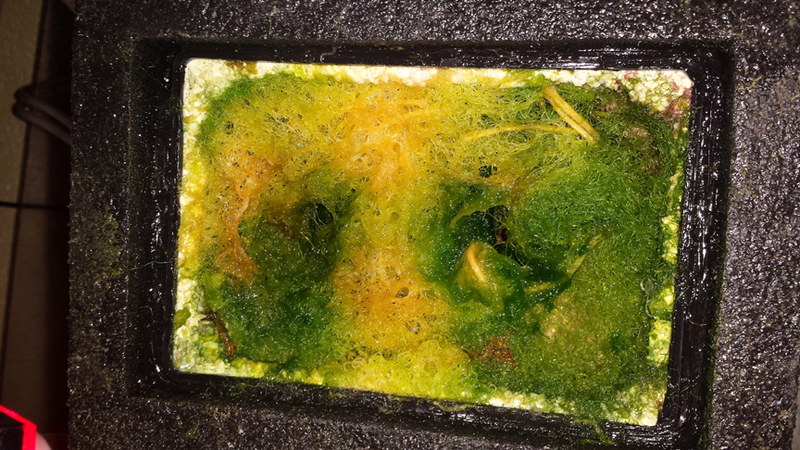 This slime layer will not get any thicker, however, because slime cannot attach well (it has no "roots") to the growth surfaces of the scrubber, and thus will get washed away when it gets thick, Also, it prevents green hair algae from attaching because of the slippery texture of the slime. So when your scrubber is new, be sure to take it to the sink and use a toothbrush to clean all the slime off of the growth surfaces so you can see all white surfaces again. You could clean it while still in your tank if you don't mind the slime particles floating around, but most people would probably do better to take it to the sink (or outside; slime makes great fertilizer). 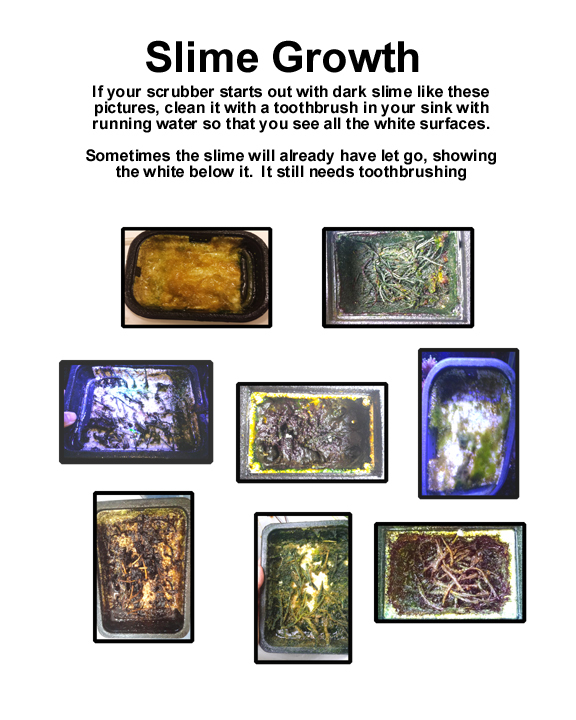 Slime, especially when dark or black, is also an indicator that you can use more watts or hours of light. 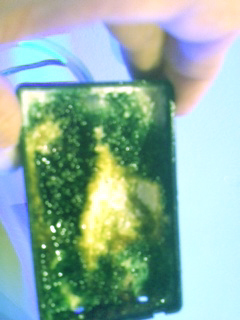 Once you have cleaned off the slime for one or more growth periods, you should start seeing green hair algae take hold. Ive always been intrigued with scrubbers and saw quite a bit of how to vids and progress vids on youtube. This thread has me excited to upgrade the tank and set up a scrubber. Its genius! Glad you like it. It's actually just nature's way of cycling nutrients, but since it's invisible, it just needs some explaining. "I pull a handful out every week" -- Choff on the R2R site.